2011′s Autumn Offerings are here ! Introducing ‘Connie Casserole’ – My very first Introduction ! It was a fabulous season for my daylilies ! The sunny days in late summer produced flawless blooms . The troublesome ‘gall midge’ only affects early flowers. I have had only a minor problem with it as I collect ‘bad’ buds like a zealot. HERE IS ‘GREEN ILLUSION’ - A ‘STAMILE’ INTRODUCTION I LOVE!! PLANTS ARE NOW FOR SALE AT SOUTHLANDS NURSERY FOR $35.00 . THE HUGE FLOWERS ARE STILL COMING AS I WRITE THIS (Sept 12th,2011) . THE FLOWER IS WASHED IN GREEN,WITH A FANTASTIC CRIMPED EDGE THAT IS APPLE GREEN !! July (and this year, August) are really like an extended Christmas for me. Every visit to my daylily field is bringing a bunch of new, first-bloom beauties to my attention. There are plenty of disappointments blooming, too. I have always loved the palest yellows/near whites the most. Making my own crosses and buying seeds online from the daylily auction (www.daylily.com) is fun alright, but it is when they bloom that it is finally payday. It takes one or two years. This year I am very happy with a batch of seedlings from a cross between ‘How Beautiful Heaven Must Be’ and ‘Victorian Lace’ . 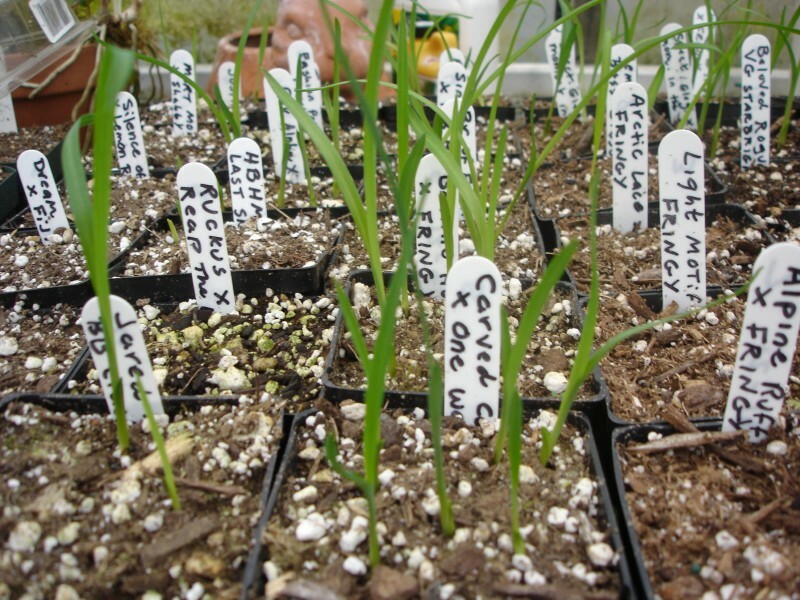 Two of the seedlings are shown in the photo here. Both have soft, Creamsicle-orange , huge flowers with wide, thick petals. Some other teriffic seedlings are blooming from a cross I bought over the internet. I paid about $6.00 per seed for ’Across The Universe’ (boy, I love that flower) crossed with ‘Fringy’ . These are all fabulous ! Three flowers are in this picture, but all ten seedlings are promising. I feel guilty if I miss a day or two visiting my daylily field. I am sure many seedlings bloom and I miss seeing their first flower. That is why I always wait to discard a plant. I have to see it in bloom myself. Out of hundreds of plants, I only keep two or three in the end. It is all very ‘Sophie’s Choice’ , but no popcorn. 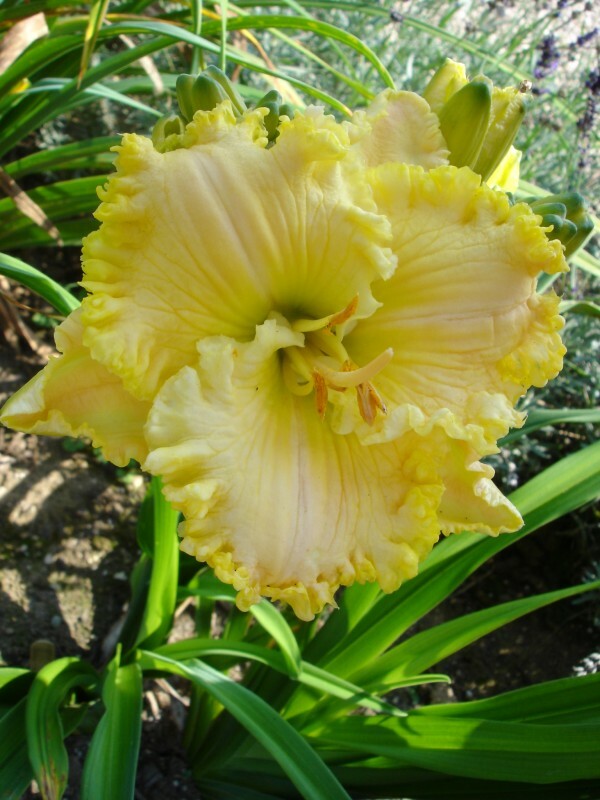 Opening the mail the other day, I was happy to receive a confirmation letter from The American Hemerocallis Society informing me that they have accepted my second registered daylily hybrid ‘Sublime Lime’ ! I chose this seedling from many hundred as being extra special. 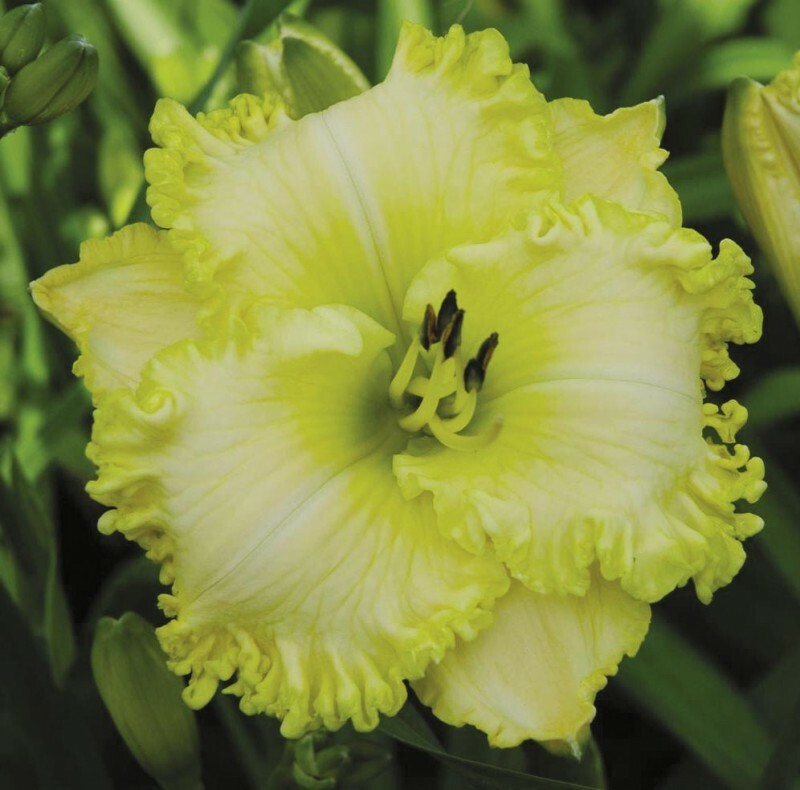 A cross between ‘Green Mystique’ and ‘Great White’ , this flower really stood out for its truly green shadings and brilliant lime green throat . I love ruffled edges on many of the new hybrids being introduced, and ‘Sublime Lime’ opens every flower perfectly without getting ‘caught-up’ on its own ruffles. The 6″ flowers begin in mid-July and are also fragrant! Plants can be ordered from us at Southlands, or from Erikson’s Dylilies in Langley, B.C. Clumps dug from my field are priced at $25.00 each. Potted plants will be available for Spring 2012 as well. I did it !! 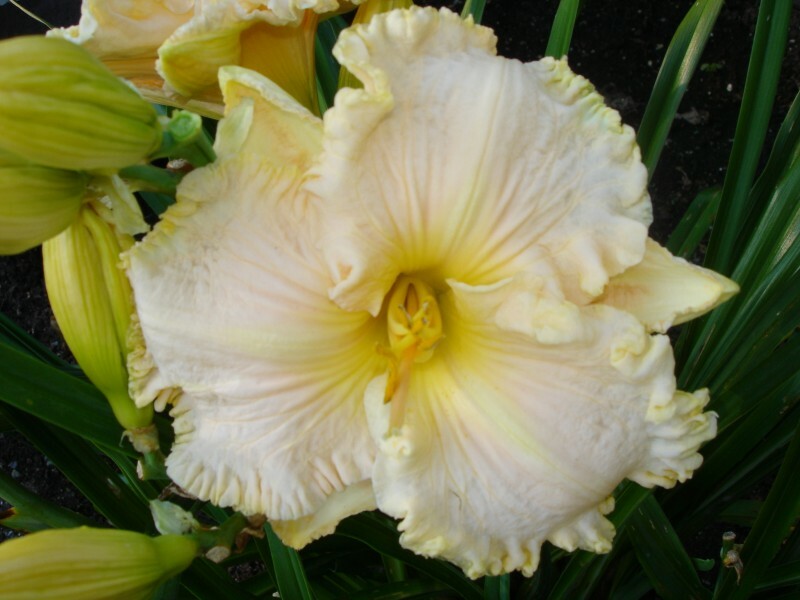 I registered my very first hybrid with The American Hemerocallis Society . I thought long and hard on which of my seedlings it would be, and what I would name it. ‘Connie Casserole’ is a cross between ‘Ferengi Gold’ and ‘Michael Miller’ . Out of this cross, I raised two outstanding seedlings, and about ten that were pretty nice. But, ‘Connie Casserole’ was the best of the best . I have to say, this plant really performs. The growth habit is exceptional, also. It quickly forms a very symmetrical clump with an unusally high number of fans. Each fan produces one or two spikes of 26 or more buds, on 24″ scapes. The blooming period goes on all summer. I love ruffled edges on a very rounded flower, and here they are ! The flowers are citrus yellow , with a faint peachy haze in full sun. It is also fragrant ! The petals are very thick, and the surface is ‘diamond dusted’ . I would say I have raised 3,000 seedlings to the flowering stage , and kept three plants. This is one of them ! I am going to introduce the other two very soon ! About the name : ‘Connie Casserole’ was the name of a very funny male character in the groundbreaking , mainstream ,1970′s gay-themed movie ‘The Boys in The Band’ . You should rent it ! It was produced by Dominic Dunne ! A limited number of blooming size single fans are for sale this spring. They are $25.00 each. 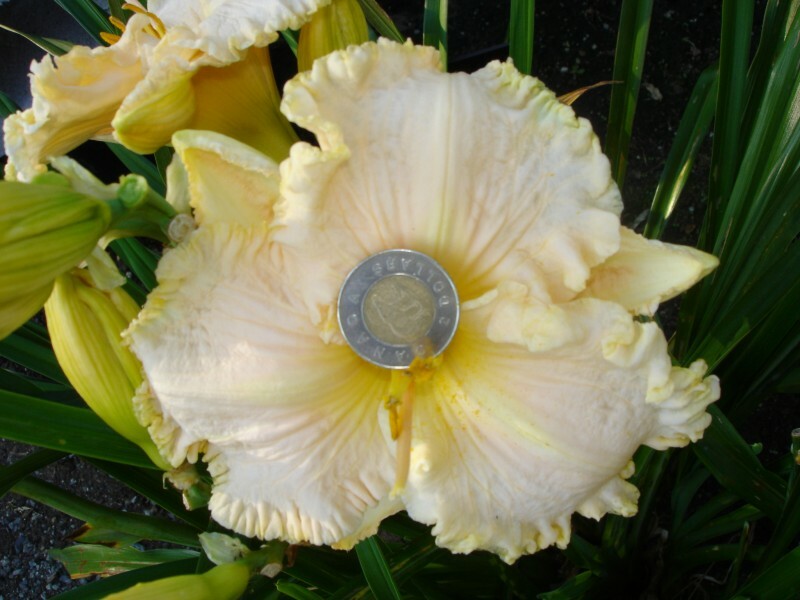 You may order them from us, (see our order form on this website) ,or from Erikson’s Daylilies in Langley, BC. I have been buying some seed crosses online at the daylily auction (www.daylily.com) and am super excited to see them germinating. It is mid-January, and seeds I planted in late December in my heated greenhouse are already 4″ tall ! Those without a heated greenhouse can do what I am doing in a very bright windowsill, or even better, under a ‘grow light’ . 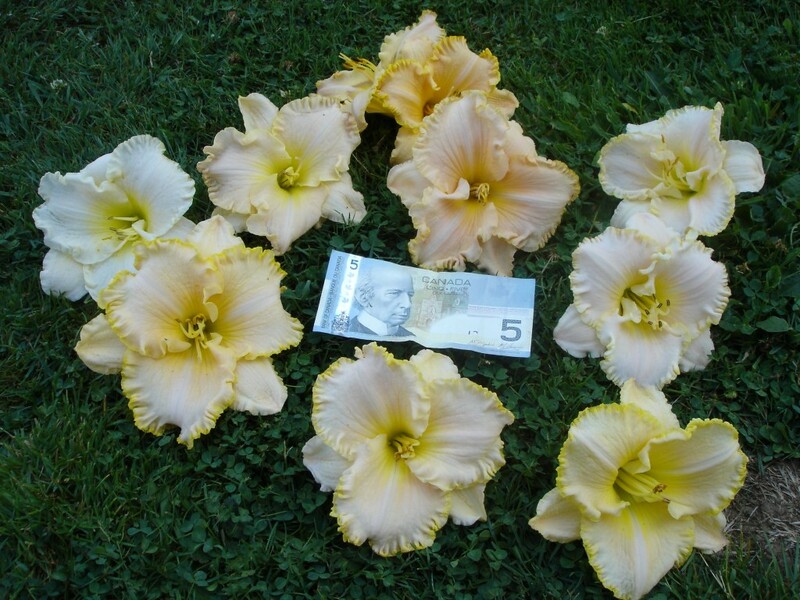 Most of the seeds I buy on the daylily seed auction come in groups of 5 to 8 seeds. I plant them all in one 4″ pot, label them for sure, and use an indoor potting mix. I add more perlite (the white particles) to make my mix extra airy and loose – to avoid seeds rotting. In about 8 weeks, I separate each seedling and plant them in their own 4″ pots, each carefully labelled. By mid to late May, they are ready to be planted outside in a sunny place, and some will bloom the first year ! They all bloom the second year. It is like Christmas morning when they bloom. Each seedling will be different, and possess some traits from each of their parent plants used to produce the seed. 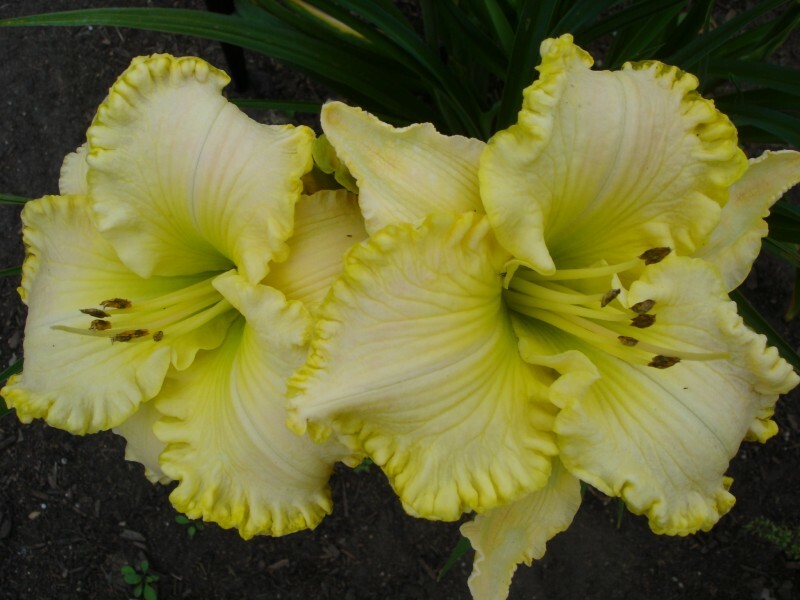 Look around at the named varieties on the lily auction – it costs you nothing to browse, and you can see the incredible varieties that are now available ! Then join the auction (also free!!!) and start bidding !! Soon, you will ( hopefully) be successful with some of your bids, and be asked to pay the vendor. Paypal is the easiest. When your seeds arrive (completely legal and hassle-free into Canada), plant away ! 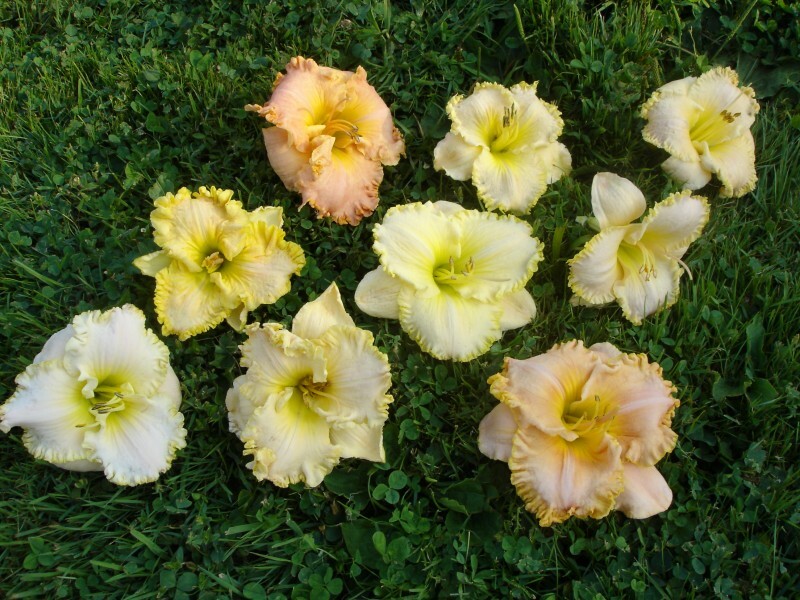 WARNING: The Daylily Auction is ADDICTIVE !! Look at what the future holds ! 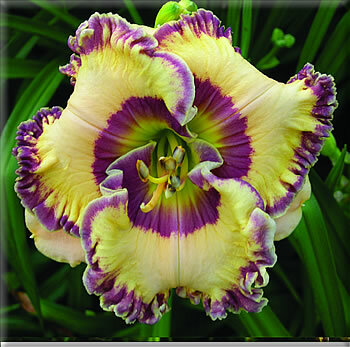 From Frank Smith daylilies in Florida (www.franksmithdaylilies.com) there are few you wouldn’t want ! Here’s ‘Keep On Lookin’ , new for 2010 . Another of my favourite sources is Le Petit Jardin, also in Florida. Here, Ted Petit has been breeding fabulous new varieties that do well in most parts of Canada. www.lepetitjardin.com . I have been importing plants from Ted for about 10 years and am particularly fond of his ’rounded petals’ look he achieves with his breeding. All of my daylilies, from anyone, go dormant in our climate. I ignore the term ‘evergreen’…… but, if I lived somewhere colder than Vancouver I would worry about hardiness. ‘Evergreen’ varieties would need lots of mulching i suspect, in very cold areas. I do think most of them would pull through, though. This huge flower first appeared in 2007. Out of about 2000 seedlings that year, it is one of only three that I kept. If you scroll down two photos, you can see where I placed a Canadian two dollar coin (which is the same size as a silver dollar) on it, to show size . It was huge, fragrant, and a lovely colour. I have divided it and have planted two rows of it, to evaluate and maybe introduce.. I made lots of crosses using ‘Victorian Lace’ as a parent , and this past summer I was thrilled with almost every seedling’s first bloom. This past summer was sunny every day, and my plants grew quickly ! So many crosses bloomed in these soft ivory/palest yellow shades (my favourites), it was hard to evaluate them all. Most of the flowers were very large, and nearly perfect in shape, with lovely ruffled edges. Several had strongly fragrant blooms, another bonus. I walk between the rows and grade them on a scale of one to ten. The lowest I found I could give was a seven ! Several plants got a ten out of ten. 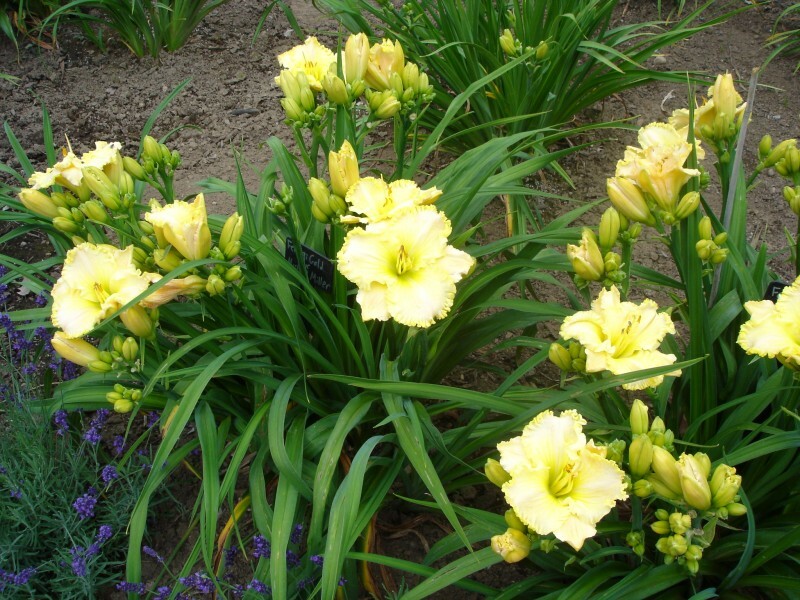 The best of these will be divided and planted out, evaluated again and possibly registered with the American Hemerocallis Society. I will name them , which is the most fun part of all.